First harvest!! 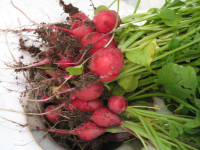 I thinned the radishes and discovered that there was a fat bunch of 'em ready to eat already. Picked a pile of lettuce, too, and enjoyed salad with some turkey burgers (a rare grilling attempt by yours truly, I'm determined to learn).